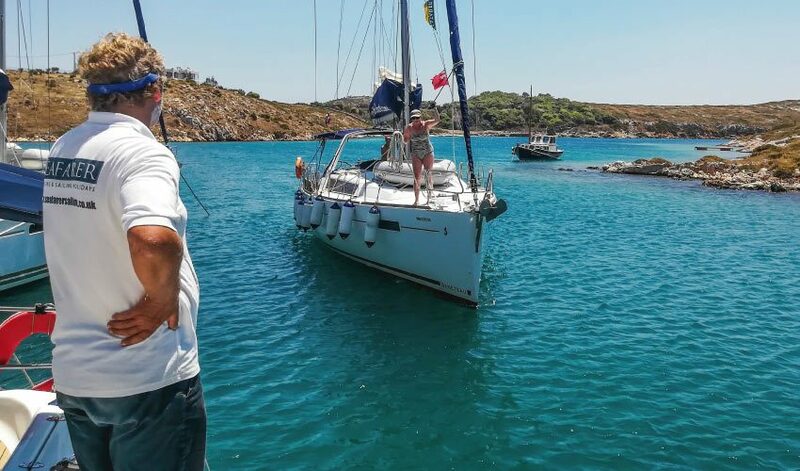 Many fine yachties come on holiday with us each year ready to embark on a cracking flotilla or bareboat holiday in one of our Mediterranean destinations but, having done most of their sailing in the tidal waters around the UK, the Stern To or Mediterranean style mooring worries them. Basically, because of the lack of tide, town quays and marinas around the med can fit boats more effectively by mooring them with the stern facing the quay. This also makes access to the stern of the boat easy using a plank or passerelle and creates a sociable quayside atmosphere. The manoeuvre itself is relatively simple but like all of those in sailing requires a certain amount of preparation and planning to ensure a smooth and stress-free mooring. The guide below is for a lighter wind Stern To mooring as is common in sheltered harbours but keep an eye out for more “How To’s” including doing this in a heavy wind. See the video below on how the manoeuvre works. Planning your entry to the harbour is very important, make sure you know where the wind is coming from, are there any hazards like moored boats or swimmers. Also, make sure all crew know what they’re doing, you will need one person operating the windlass on the bow and if possible someone to help with stern lines in the cockpit. Communication is as always very important to make sure the skipper can communicate clearly with the crewmember on the windlass. The first thing to look for is a suitably sized space for your yacht on the quay, don’t try to fit into a space that’s far too small and you won’t be very popular if you fill a space that could fit two boats. Head into the harbour and approach the space in reverse dropping the anchor as far away from the key as possible (at least 4 boat lengths) in line with the neighbouring chains. Reverse slowly towards the space turning the stern of the boat towards the wind and make sure you balance the speed of the boat with the force on the windlass. When the boat is a third of a boat’s length from the quay stop dropping the anchor and make sure crew at the stern are ready. As you stop the anchor, your engine should be in neutral, with a small touch of forward to bring the yacht to a stop. If no one is on the quay to catch your lines, then this should be at a suitable distance for a crew member to step ashore with the windward mooring line. When you are close to the quay the crew takes the windward stern line ashore and passes it through a ring or similar at roughly 45 degrees to the boat before passing it back to someone in the cockpit. This is then secured and sweated if necessary to get the boat in the correct position (see the video for more details). When the windward line is secured do the same for the leeward line making sure the yacht is the correct distance from the key. During this process, the skipper may need to motor forward or backwards slowly. To finalise the manoeuvre you need to tighten up the anchor chain with the windless till it’s at 45 degrees which will set the boat in its final position. If you’re leaving the boat for any time snub a line onto the anchor cable and around a cleat on the foredeck to take force off the windless. When you’re happy your ship is secure sit back and enjoy your favourite post sailing tipple. Hopefully, this guide and video will help you to understand the Stern To mooring process and take the worry out of the end of day manoeuvre. If you’re considering the Lefkas or Kefalonia Flotilla and you’re still worried about this or any other areas we can offer Pre-Flotilla training at Nikiana Beach Club on the island of Lefkas with 2, 4 and 7-day accommodation options.